OPC Data Connection for Excel will enable Excel to connect to OPC servers for a range of PLC types, including Allen Bradley, Siemens, GE Fanuc, Omron etc. Using a simple user interface any cell in a workbook can be linked to specific I/O points in the PLC, so that if the value of the I/O changes, this is reflected in the Excel cell. This also function in the opposite direction: if a value is entered into a cell, the value is written to the PLC I/O point. Links can also be configured as read-only or write-only. OPC Data Connection for Excel is a generic product that can be linked to a range of PLCs, but this is accomplished in conjunction with a second piece of software which is PLC-specific. This second piece of software is called an OPC server. So in fact you need two pieces of software: 1) OPC Data Connection for Excel and 2) OPC server for PLC. For end users such as operations personnel, who don't want the hassle of writing VBA in Excel, the OPC Data Connection for Excel add-Ins are perfectly simple and ready to use. 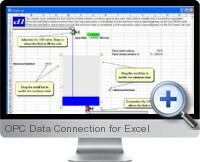 The OPC Data Connection for Excel add-in can be used for real time data access. This product supports OPC DA. The OPC Data Connection for Excel add-Ins seamlessly integrate with Excel to do whichever OPC tasks required such as pre-formatted report templates, periodic OPC data acquisition, pre-scheduled reporting, generating reports when needed, data analysis, trending, sending/writing of settings to the process controllers, and exporting to web (HTML format).